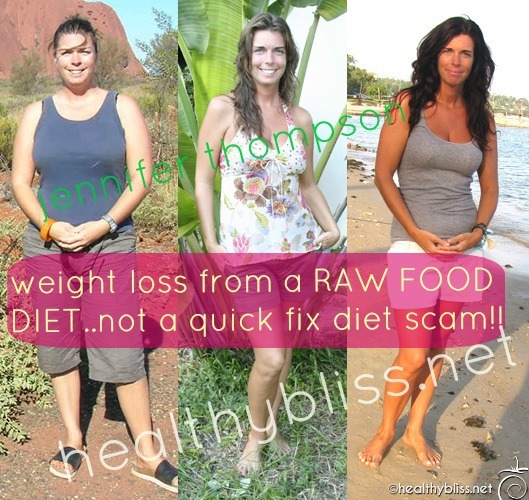 It’s been almost 10 years since I started my raw food journey. I continue to feel better, more energetic, healthier and younger every day! And I have maintained my weight loss without ever feeling like I am on a limiting diet. I purposely kept this bathing suit and sarong because in the left photo, I knew I was ready for change. I mentally planned to do my “weight loss before and after photos” long before I even started to lose the weight. I felt so proud in the right photo knowing that I achieved my goal! Losing weight is just one of the many benefits in changing my diet. My skin clearing was my biggest accomplishment in going raw, doing detox and seeing the results. 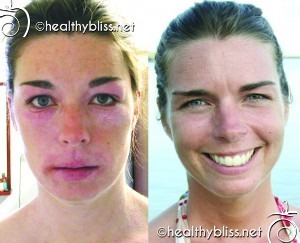 For more than 2 years, I suffered with an uncomfortable, irritable rash that was “diagnosed” by doctors as just about everything, including eczema, psoriasis, urticaria (hives), dry skin, contact dermatitis and depression. My face was puffy and I had terrible water retention too. Thousands of dollars and hours in waiting rooms, and they never found the cause. Eventually, I took control and I invested my money in better food. I also started an elimination diet, and found the cause of my rash to be from an intolerance or allergy to certain chemical food additives. That discovery is what led me to completely change my diet and my life. Fast forward to present day where I now get compliments on my skin all the time – how clear and healthy it is, my hair – how natural and clean it looks, and my eyes -how clear and vibrant they are…these are things I never heard when eating a devitalized food diet. Also my energy has improved and I have more passion about the things I do in life, something that I never expected from simply changing my food!! I feel more connected to my body and to Mother Earth. I LOVE getting up in the morning and seeing my healthy face in the mirror. I digest food better and I enjoy the flavors in food more, and believe me there are so many beautiful delicious flavors in simple natural foods – just try fresh tamarind, ginger, jack fruit, apricots, papaya, pineapple or mango and you will understand! 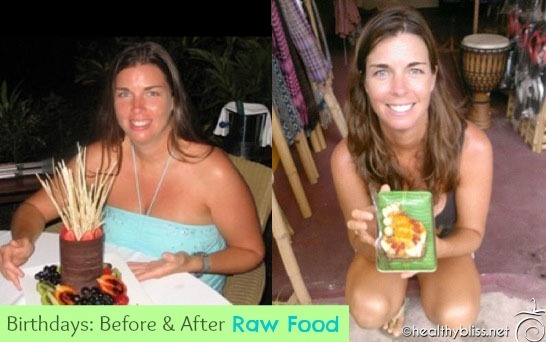 Keep in mind that you do not have to commit to a 100% raw food diet in order to enjoy the benefits of raw foods. Most of my clients for coaching and Iridology are finding a lot of success on anywhere from a 50-80% alkaline, high raw food/vegetarian, plant-based diet. The real transformation happens not from a quick fix diet, but when you make long-term changes and healthy habits for life. It’s important to start at your own pace and know that any small step in a step forward, however small. Your body will be grateful to receive any natural vibrations from Mother Earth! I support you on your journey to better health and vibrant living and Mother Earth supports you too! I now offer one-on-one Health Coaching to help YOU achieve your health goals. 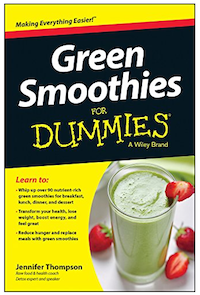 I can help you identify where you may be making mistakes and get you on a fast track to feeling good and looking great. There is nothing special about me, in fact, I am exactly like you! So, if I can do it, trust me, you can too! You can be your own Success Story, I believe in you! Affirmation: I release all tension, fear, anger, guilt and sadness. I let go of old limitations. I am at peace with myself. "You can't heal one disease and keep two others. When the body heals, it heals everything."